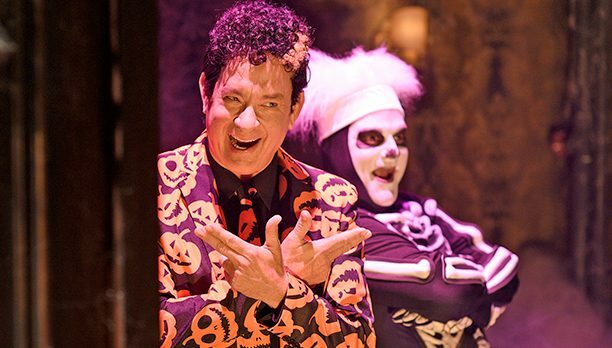 Halloween spirit was all of over the television landscape like never before in 2016, with more than a few series and specials celebrating our favorite holiday, including the October 22 episode of NBC’s Saturday Night Live, hosted by Tom Hanks, which featured three seasonal sketches, one of which became a viral sensation with Hanks playing an enthusiastic horror show host known as David S. Pumpkins. Now one of the writers of the bit have revealed what the “S” stands for in Pumpkins’ middle name. Speaking with The Huffington Post, Saturday Night Live cast member Bobby Moynihan, who co-wrote the sketch and played one of Pumpkins’ dancing skeletons, disclosed that Pumpkins’ middle name is …Simon. You can watch the fun sketch below, in which a couple takes a ride on a haunted elevator Halloween-themed attraction called 100 Floors of Frights, but it is more “Pumpkins” than they bargained for.